Take a private transfer from the airport to your hotel – the remainder of the day is yours to spend at leisure. This is New Zealand’s largest city with a cosmopolitan vibe and a friendly atmosphere. With countless boutiques, restaurants and fun activities to enjoy, there’s plenty to fill your days with while you’re here. Collect your hire car (Holden Barina (CDAR) compact automatic or similar) and begin exploring Auckland and its surrounds. There’s so much to do here, with the city sitting in one of the most beautiful natural harbors. Waiheke Island is a popular choice, as it’s brimming with gorgeous beaches and vineyards. Alternatively, just a short distance from the heart of the city is Rangitoto Island - you can take a ferry over to this volcanic region to hike to the summit. 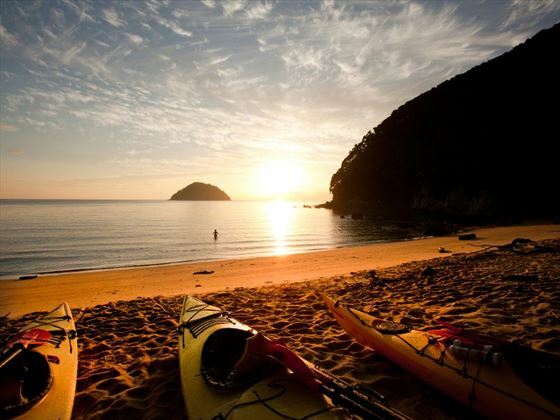 Venture towards the Bay of Islands today. This normally takes around 3.5hrs but plan a little more time to admire the scenery along the way. Visit the township of Puhoi, New Zealand’s only bohemian settlement, and explore the galleries and cafés of Warkworth, the harbor side of Whangarei and the township of Kawakawa. Upon arrival into the Bay of Islands you’ll be greeted with stunning sub-tropical scenery of luscious hills wrapped in green foliage and golden beaches. 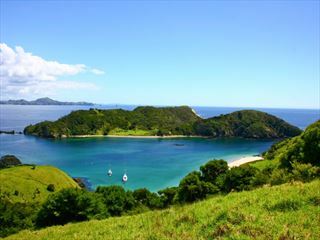 Explore the Bay of Islands today with a cruise around the islands or even with a trip to swim with the dolphins. Just a short distance north of Paihia is one of the most significant historical sights of modern New Zealand – the location where the Treaty of Waitangi was signed. There is a fascinating visitor center where the story of this event is told, set amongst beautiful grounds. On the other side of the bay you’ll find Russell Township, rich in heritage, history and stories from its time as the ‘hell hole of the Pacific’. There are guided tours available if you want to explore more of the beaches, local food and wine, or the local Maori culture. Depart from the Bay of Islands and head west, leaving the Pacific Ocean and arriving into the Hokianga and the wild waters of the Tasman. There are some great places to stop and unwind along the way, including the small townships of Omapere and Opononi which both have a charming seaside feel. 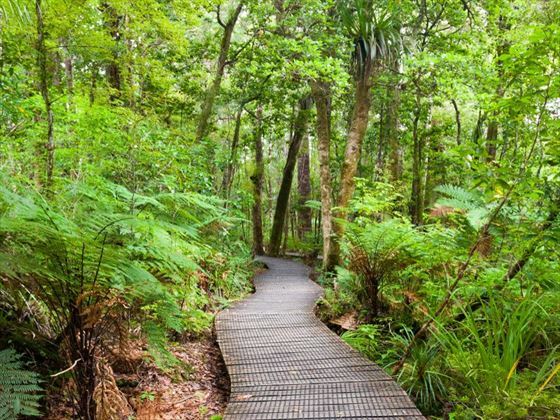 Your route will take you south to the Waipoua Forest, where you’ll find the mighty Kauri trees – be sure to allow time for a few scenic walks as you pass through the region, which are signposted. Another must-see is the five-minute loop to view the largest of all the trees – Tane Mahuta. Head back across the country to Matakohe Kauri Museum, which has plenty of information and history surrounding the region’s logging, farming and social history. Just a short distance from Warkworth is a township called Matakana, situated by the coast. 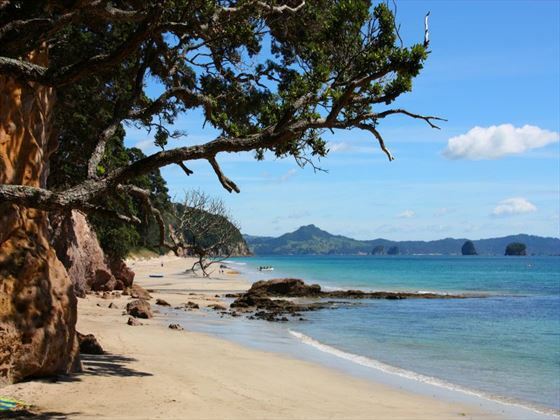 A little further on, there is also a selection of secluded beaches at the Tawharanui Marine Reserve. Head south today along the Hibiscus Coast and venture into the ever-changing landscape, which merges from the city boundaries into farmlands and rolling hills. Visit the Hauraki Plains are one of the largest dairy producing regions in New Zealand and the Thames Estuary, a great spot for wildlife and bird spotting. Upon arrival into the historic gold town of Thames, you can choose one of two routes to the east coast and Coromandel – traveling straight over the Coromandel Ranges or the longer but more scenic route along the Pohutukawa Coast. This is highly recommended as one of the most amazing drives in the region. Extending from Waihi in the south to Port Jackson in the north, the Coromandel Peninsula is a stunning region that provides some truly spectacular mountain scenery. Once a popular gold mining area, there are still known deposits of gold, silver, lead and zinc which run throughout the ranges. This is a really diverse area, with many secluded bays, tranquil towns and a rich pioneer history to explore. The west coast of the peninsula leads down to the Firth of Thames and the steep pohutakawa cliffs, while the east coast has more beaches and isolated inlets. As you pass along the east coast, you’ll journey through the town of Whitianga where you can take a small ferry over to Cooks Beach and Flaxmill Bay. Cathedral Cove is a popular walk and ideal if you want to admire the view of the massive limestone formations which are found on the beach. Leave the Coromandel Peninsula today and pass through the seaside town of Whangamata, a popular vacation spot for New Zealanders as it has one of the best beaches in the region. Rail enthusiasts will love a visit to the Goldfields Railway, which operates passenger trains along the historic and scenic section of the track towards Waikino. 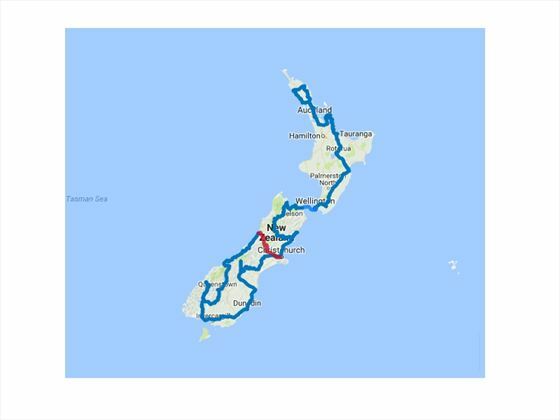 From here, the route takes you into the Bay of Plenty and Tauranga before making your way along the scenic Pyes Pa Road to Rotorua. If you’re a Lord of the Rings fan, you’ll love a quick detour to Matamata which is the location of Hobbiton. Sitting at the center of the world’s most volcanically active region, this is a unique and interesting place. 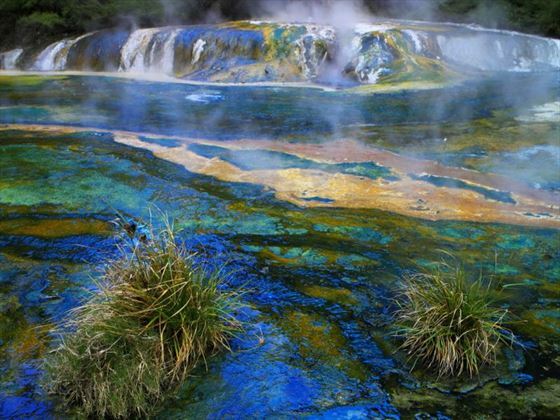 The smell of sulphur is a side effect of the geothermal activity and no visit to Rotorua would be complete without visiting one of the geothermal parks in the area. Wai-O-Tapu Thermal Wonderland is just 30 minutes from the center of Rotorua, taking you on an adventure through bubbling mud pools, sulphur ponds and geysers. The ‘Buried Village’ or the village of Te Wairoa was destroyed during the Tarawera eruption and you can now explore this historic area, where there is a dedicated museum which tells the story of this area. Rotorua also offers much more than just volcanic sites and geothermal activity. Its lake is stocked with trout, making this a popular spot for fishing, and there are also farm tours and sheep shearing shows, in addition to the usual adrenalin-fuelled activities New Zealand is known for. This portion of the journey takes you through the thermal regions situated south of Rotorua. Wai-O-Tapu, Waimangu and Craters of the Moon near Taupo are just some of the locations you might like to visit. As you approach Taupo you’ll see signs directing you to Huka Falls, which is one of the most astounding sights in this region and a must-see as you journey through this area. While you’re here, why not take an exhilarating Hukajet boat ride? 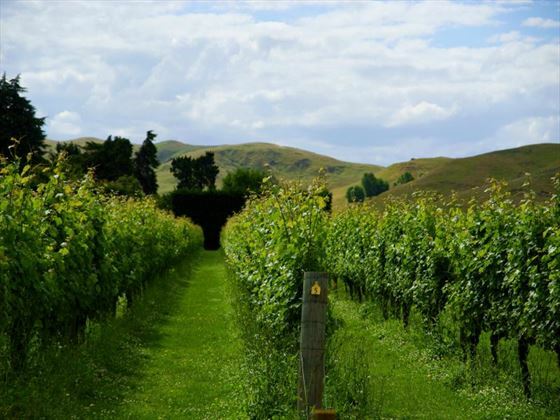 Hawkes Bay is one of New Zealand’s best wine producing regions and there are plenty of tours available where you can sample the produce and admire the luscious vineyards. Napier is also well worth a visit, with beautiful art deco buildings and a rich history. Take a city tour in a car from the 30s or explore the museum here; Cape Kidnappers is home to one of the few mainland gannet colonies – take a trip along the beach via tractor for a unique way to see these birds in their natural environment. The beautiful countryside of Hawke’s Bay leads you to some of the richest farmland around the Manawatu region; you’ll pass along the Manawatu Gorge and on to Masterton which is home to the Golden Shears Sheep Shearing competition; just a little further on you’ll reach Greytown which boasts the highest concentration of historic wooden buildings in the country. Your day ends in Martinborough, home to boutique wineries and beautiful scenery. Crossing the Rimutaka Ranges, you’ll drop down towards the harbor and Wellington City; a place filled with countless museums, including Te Papa which is New Zealand’s national museum and a must-see. Take a cable car ride from Lambton Quay to the hills of Kelburn for some of the best views of the city, with the ride ending in the botanical gardens – a beautiful place in itself. If you want something slightly more energetic then you can always take the more challenging but equally rewarding stroll along the waterfront and to the top of the hill at Mt Victoria. Drop off your hire car and take a ferry ride from Wellington to Picton, taking around 3hrs and offering up some beautiful scenery along the way. You’ll pass several interesting points as you leave the harbor, including Pencarrow Head, Red Rocks (home to a seal colony) and Oterangi Bay. You’ll journey through the Marlborough Sounds for around an hour of your journey, a region which is covered by mountains, islands and crystal-clear waters. Upon arrival into Picton, pick up your hire car (Mitsubishi Colt compact auto or similar). Today will be spent in Abel Tasman, a place renowned for its glorious golden beaches. The mild climate here makes it a great place to visit at any time of the year, with the main attractions being the many beaches, sea kayaking and walking trails. Enjoy a wonderful cruise along the coast to admire the scenery. Journeying through Marlborough, you’ll be able to admire the beautiful scenery of this premier wine producing region. Time your day to arrive at lunchtime with a view to sampling some of the delicious wines created here. From here, head towards the Kaikoura Coast which offers amazing opportunities to see some of the native wildlife and seabirds. To the east is the South Pacific Oceana and the Kaikoura Ranges are found to the west. 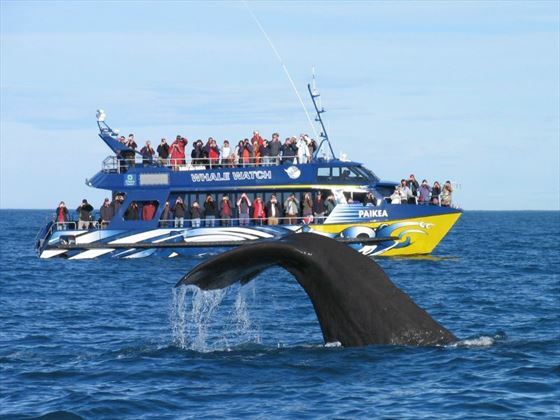 Kaikoura is one of the few places worldwide where whales can be seen year-round. 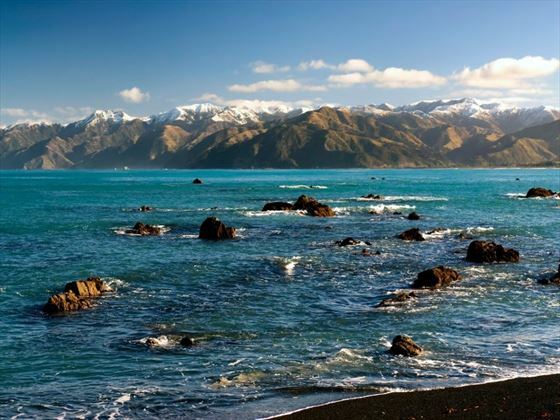 Renowned for its wildlife, Kaikoura is a brilliant place to explore. The waters are brimming with dolphins, whales and seals, which can be observed all year. If you don’t want to head out to sea to witness these marvelous creatures, you could take part in a scenic flight over the area. Kaikoura township is a quaint location but lovely to explore, with plenty of shops, restaurants and cafés to enjoy. If you want to explore further afield, you can make the most of the landscape with biking, hiking and golf. Drive from Kaikoura to Christchurch via spectacular coastline before heading inland through the North Canterbury wine region – the Waipara Valley. If you want a relaxing and worthwhile detour, visit Hamner Springs for a dip in the thermal pools, before arriving into Christchurch. Explore Christchurch today – a compact city which is best explored on foot. Be sure not to miss the International Antarctic center which offers an insight into life in this breath-taking polar region, as well as Willowbank Wildlife Reserve which gives you the opportunity to see some of New Zealand’s native birds. 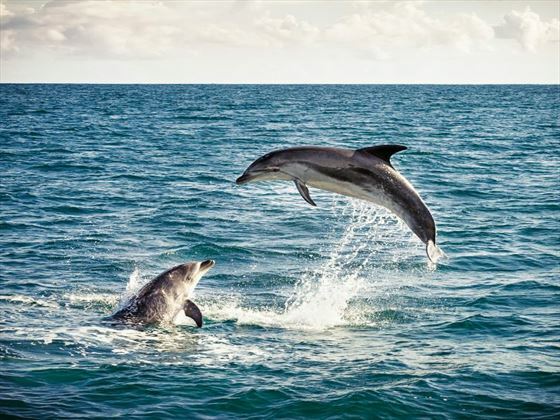 If you want to head a little further outside of the city, take part in a wildlife cruise which departs from Lyttelton and showcases the rare hectors dolphins in their natural habitat. In the evening, visit the Tamaki Heritage Village which introduces you to the traditional Maori culture with performances and an authentic Hangi feast. Venture into the heart of the South Island as you cross the Canterbury Plains and to the first township of Geraldine for a refreshing stop en-route to Mackenzie Country. Pass through places such as Beautiful Valley and then ascend Burkes Pass to the town of Lake Takapo. The options for things to do here are varied, from a scenic flight to a guided horse trek, boat trips or simply admiring the views. Just 30 minutes on from here and you’ll reach Lake Pukaki where you’ll have your first view of Mt Cook National Park. If you’re a film fanatic, you’ll want to stop off at Twizel which is just south of Mt Cook and the setting for many Lord of the Rings scenes. The town of Oamaru is famous for its buildings constructed with unique locally-quarried white stone – if you’re happy for a late arrival into Dunedin, then make time to explore the old quarter and wait around to see the blue penguins come ashore at dusk. Further south, the Moeraki Boulders are worth a short beach detour to witness for yourself. A city filled with fascinating architecture, Dunedin is an interesting place to explore – listed as one of the top 100 buildings in the world, Dunedin Railway Station, in particular, is worth a visit. From here, you can take a scenic train ride along the Taieri Gorge. The Otago Peninsula is a short drive from the city center and offers unique wildlife experiences, including the only mainland Royal Albatross colony in the world. Drive to Te Anau, a journey which takes you through classic Southland farmland. If you want to explore a little off the beaten path, however, take the route through The Catlins which comes highly recommended. Following the amazing Otago coastline to Invercargill, you’ll pass through the fishing town of Riverton and Colac Bay before heading north through Tuatapere and onto Manapouri. 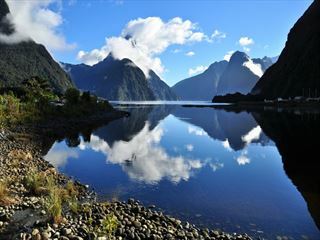 Upon arrival, you can embark on a day or overnight cruise to Doubtful Sound. A short distance north and you’ll reach the township of Te Anau, the gateway to Fiordland National Park and the famous Milford Sound. Drives along the Milford Road shouldn’t be rushed, with countless photo opportunities and short walks along the way. The Mirror Lakes provide crystal-clear reflections of the mountain scenery surrounding the area, coupled with glacier-formed meadows and native beech forests. The chasm which is a 15 minute walk away showcases the incredible power of the water, as it continues to shape the valley. Milford Sound is the most famous of the sounds that lie throughout Fiordland National Park, as well as being the only fiord accessible by road. A cruise onto the waters of Milford Sound is highly recommended, as this magnificent experience offers the opportunity to see some of the wildlife here in addition to the scenery. 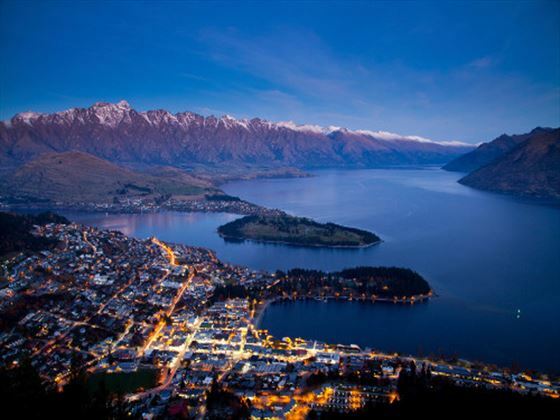 Make your way to Mossburn – the deer capital of New Zealand – then on to the shores of Lake Wakatipu, where you’ll find Kingston. Follow the lake north as the Remarkables mountain range overshadows the scenery upon arrival into Queenstown. Queenstown is a destination for ages, tastes and abilities – it’s clichéd but entirely true to say that there’s something for everyone here. Known for its vast array of adrenalin sports, visitors to Queenstown can take part in anything from bungy jumping and skydives to rafting and mountain biking. But there are relaxed activities too, including wine tours, visits to the historic gold mining town of Arrowtown and picturesque cruises. A great trip from Glenorchy, which sits at the head of the lake, is a river safari which is one of the most scenic jet boat excursions in the country. Arrive into the alpine town of Wanaka today, having traversed the highest sealed road in the country, and follow the shores of Lakes Wanaka and Hawea before you reach the township of Makarora. This is the gateway to Mt Aspiring National Park. 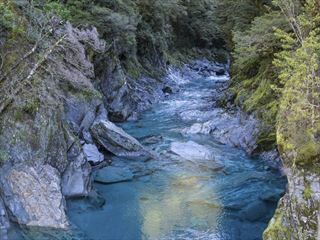 As you descend into the park you’ll be heading towards Haast Pass, where waterfalls and dynamic rivers are found at every turn. You’ll officially be on the west coast once you cross Haast River, immersed in bush landscapes, rainforests and podocarp forest. You’ll reach Fox Glacier first then Franz Josef township just 45 minutes on from here. Franz Josef’s main attraction is the mighty glacier – few places in the world have such large glaciers almost at sea level, but what’s even more unusual is that the lower slopes are virtually rainforest. There are numerous guided walks to and on the glacier, where you can learn more about this renowned feature and the surrounding landscape. Alternatively, you can take a scenic helicopter flight with astonishing views of Franz Josef. Drive north from Franz Josef to reach the largest town on the west coast – Greymouth. This is the starting point for the Tranz Alpine scenic train route. Drop off your hire car and begin your journey through the phenomenal scenery on your way to Christchurch. This is largely considered to be one of the most spectacular train rides in the world and you’ll instantly realise why – the views are amazing. 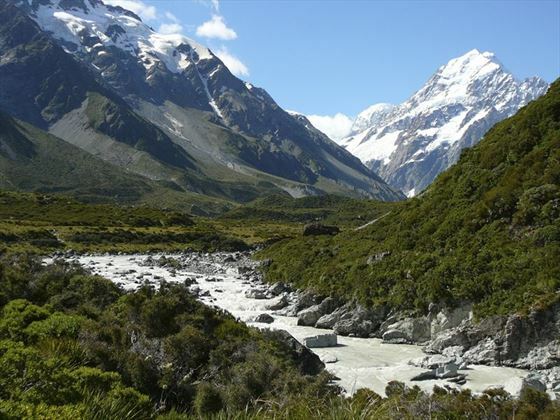 Some of the sights along your journey include the Otira Valley and the mountains of Arthur’s Pass National Park. You’ll arrive into Christchurch in the evening. The jaw-dropping 23-day self-drive itinerary takes across the landscapes of the North and South Islands, introducing you to the very best New Zealand has to offer.